Tehama County Shooting: At Least 4 Victims Killed At School, Other Locations In California : The Two-Way The shooter began at a residence and traveled to "multiple locations" before shooting students at an elementary school in Tehama County, an assistant sheriff said. Officials say the shooter is dead. 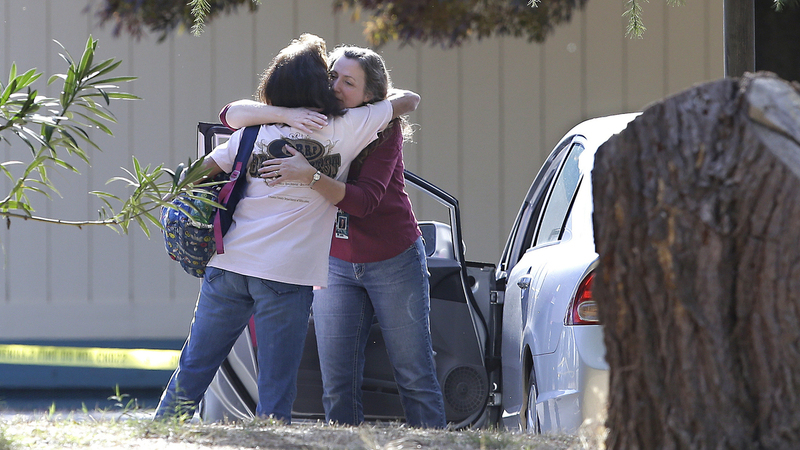 Two women embrace outside Rancho Tehama Elementary School, in Corning, Calif., where a gunman opened fire Tuesday. At least two children are among the wounded — a student at Rancho Tehama Elementary School in Tehama County was shot, and another child was shot in a truck along the road, according to county Assistant Sheriff Phil Johnston. A woman driving the truck was also shot; all three are being treated. Johnston said that a greater tragedy was averted due to the quick thinking of school officials. They heard the shooting from about a quarter-mile away and immediately corralled all of the students inside and locked down the facility. "The quick action of those school officials, there's no doubt in my mind, based on the video I saw, saved countless lives and children," he said in a late afternoon news conference. The first calls about the shooting came in shortly before 8 a.m. local time on Tuesday, Johnston told reporters. They described a shooting on Bobcat Lane where the shooter killed two people, including a neighbor he had been accused of stabbing earlier this year. The gunman took a vehicle from Bobcat Lane and started shooting at random residences. Police almost immediately received a series of 911 calls reporting the gunfire. The gunman soon arrived at the elementary school where he crashed through the gates in his stolen vehicle and stood in the school quad, firing at classrooms for about six minutes. No one was killed at the school. Johnston said the gunman, apparently frustrated, left the school grounds and resumed his random shooting before crashing the vehicle. He then stole a second vehicle and was shooting once again when two law enforcement officers killed him. Authorities have said they don't know of any connection between the school and the shooter. The gunman appeared to be "randomly picking targets," and no motive has been identified, Johnston said, adding that the entire incident lasted about 45 minutes. He said the suspect has been identified, but his name has not been released pending notification of next-of-kin. A "semi-automatic rifle and two handguns" have been recovered, Johnston said. NPR's Nate Rott spoke to resident Tiffany Rodgers, who says she knows almost every student at the elementary school and heard the shooting from a nearby cafe. Rodgers told Nate that she could hear "over 100 rounds go off" and heard screaming. The shooting is "just devastating" for the small, tight-knit community, she says. Reporter Sara Stinson, calling Action News Now from the police roadblock, told the news channel there is a shot-up, taped-off truck on the road, and several worried parents unable to get past the roadblock and struggling to find a cellphone signal. "Rancho Tehama resident Salvador Tello said he was taking his three children to school when the gunman fired at a truck in front of him. "He said he saw bullets hit the truck in front of him, so he made his children get down and put his truck in reverse. "Tello said that, as he left, he saw a woman lying dead in the street with her husband next to her, apparently wounded." Enloe Medical Center in Chico tells NPR that it has received five patients, three of whom have been treated and released. Law enforcement officers from a range of agencies have responded to the incident, including the Highway Patrol and the FBI. Johnston said there were more than 100 officers helping cover the multiple scenes. "It's a very sad day for us here in Tehama County," he told Action News Now, tearing up. Rancho Tehama Elementary is a small school, serving students in pre-kindergarten through fifth grade. There are just four teachers on staff; each teaches at least two grades, according to the school newsletter. Tehama County is a rural community about a hundred miles north of Sacramento. The largest town in the county, Red Bluff, has a population of about 14,000, according to the Census Bureau. Gov. Jerry Brown issued a statement offering condolences to families who lost loved ones in "today's violence in Tehama County, which shockingly involved schoolchildren." An earlier version of this story incorrectly referred to the Redding Record Searchlight as the Redding Record Spotlight.